My great grandmother Johanna Elizabeth Susanna Diedericks (previously du Toit, born Joubert c.1887) was married to Johannes Hendrik Petrus Goosen (age 70) in 1947 at Bronkhorstspruit. She died in Cullinan around 1971, not sure if this Hendrik is at all related to the one in the listing. my name is Miranda Jansen and my grandmother is Francisca Goossens, daughter of Ivan Goossens. Her sister Julia Goossens immigrated to Michigan with her husband Joseph Jansen. I found her Donna Edel, Aunt Julia granddaughter and still are in touch through facebook, with her children. Really want to know more of my family in Michigan. Are there any pictures? I found youre nice website. Also i found our Family. On Evert Louwe Goosen, VII39 there are missing people. How do you get those information? Looking for any information regarding Johannes Goosen, born 1942 and passed away 1983. Johannes was married to Rosemary Merle Gordon-Stuart. Brothers known as Cois (Francois?) or Frank and Martin. Could also be Francois and Marthinus. Lived in Brakpan. Johannes was known as Johnny Goosen. Played water polo in Brakpan. I would like to thank you for this amazing website. I never knew there were so many Goosens around the world. Sadly i will never know my family tree as my father's father passed away before my dad was even born. All i was ever told was that my grandfather came from South Africa and settled down in Zimbabwe. He used to own cattle which he dipped near Lower Gweru. I am Theresa Prinsloo born Goosen 29/09/1959. My father Leon Arnoldt Goosen married Hester Kotze. My brother is Dirk Jacobus Goosen. My sister Charmaine Lombard born Goosen. My fathers father was Jacobus Ockert Goosen. His mother was Theresa Goosen ( by incident Goosen married Goosen although they were not direct family. My grandfather Herbert Goosen was born in South Africa. He married Johanna Christina Fuller. Their children's names are Nicholas Johannes Goosen, Denis James, Maureen and Robert Cecil Goosen. I would like to find my great grandparents. apparently Herbert's family are from Belgium. What I do understand is that my grandfather also had a step mother.....don't know what her name is. Dodrecht in the Cape has been mentioned, but not sure where this ties in. 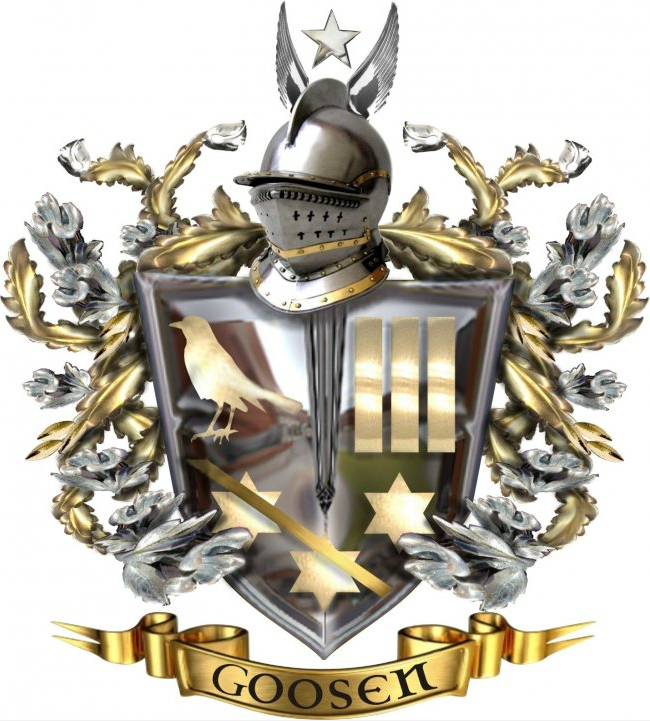 Thanks for using the coat of arms I designed, I feel honoured that you have used my artword in promoting the Goosen family name and like to thank you for all your hard work you have put into this website over the years. Like yourself I also do not like to copyright my work as long as I get recognition when it is copied and used on other sites. Over the years a lot of my work has been copied from my website http://www.sketchme.org and http://family-shield.blogspot.co.uk/2015/10/goosen-coat-of-arms.html without any recognition. I have copied a little paragraph from your 'Coat of Arms' page and posted a link on my site to your page, I hope you do not mind. Would it be at all possible that you also give me recognition for my artwork on your site? To Tracey-Lee Harris -- I think your Ouma Nellie was either my father's aunt or great aunt. My father was Frank (or originally Frans - he changed his name), the son of Rupert who was married to Eliza Oberholzer. Rupert's brother Samuel was married to Petronella Oberholzer(she & Eliza were sisters). I have two copies of articles written for the"Buffalo Bellow" a newsletter of the Bubi & Inyati district. These articles were written by Petronella Goosen about her experiences in the Boer war etc. I would be happy to send copies to you. Ik ben al geruime tijd bezig om enige informatie over mijn opa te krijgen. Mijn opa is Berend Horlings en nu zie ik vol verbazing zijn naam hier op uw site. alles klopt zijn geboorte en overlijdens datum zijn werk en dat hij in Amsterdam woonde. Ik zou het fijn vinden om meer over mijn opa te weet te komen. Er is namelijk een enorm grijs gebied in zijn verleden. niemand die mij er iets over kan of wil zeggen. In de tijd da ik mijn opa leerde kennen hebben wij altijd wel een band gehad maar over het verleden zijn verschillende verhalen. Ik ben zelf geboren in 1965 en tot aan zijn sterfdatum heb ik hem mee gemaakt. I have married on 05-11-1971 with Petronella Jantina Blaauw , born on 22-03-1951 in N.O.P. , Holland. Dominique Goosen, daughter, born on 18-12-1978 in Zwolle. Married on 22-08-2002 with Edwin Hendriks, born on 08-03-1977 in Zwolle. Martijn Goosen, son, born on 25-03-1981 in Zwolle. Married on 23-05-2013 with Mariska Kingma, born on 13-05-1984 in Zaandam. I hope you can change this data en i thank you in advance !! I am a descendant of Heinrich. My great grandmother was the daughter of the second marriage of V.6 Jacob D Goossen to Maria Foht. My great grandmother, Katharina Goossen, was born at sea on the S.S. Selisia in 1874, the year of immigration to the U.S. Katharina married Martin P Dickman (Duekman) at Mountain Lake, Minnesota, and settled at Marion, South Dakota. Her father, V.6 Jacob D is buried in South Dakota and daughter Katharina is buried at Yankton, Turner County, S.D. My grand father was from Frankfort. Sadly passed away 2 years ago. Would be so nice to be able to know whether I am actually distant relatives of some of these people. If there is someone that knew Theo Goosen, please get in touch. I'm a descendant from Antonius Mossel, who married Johanna Jacobs Gosen. I like your site very much, and I found interesting information about the Gosen side of the family that I didn't know. Thank you very much! The name Goosens appears in the family of my cousins who were descended from Vander Poorten originating from Lokeren. There is a lady named Scholastica Goossens born in 1794 in Zele ,.She was daughter of Zacharius Goossens (macon) and Seraphina Geeerink. She died in 24/5/1849. Can anyone provide further information ? My ouma was wilhelmina adriana(adrijana)goosen b 7-10-1909 d29-10-1999 haar pa willem adriaan goosen (hier raai ek oor sy datums b 1850 d 1922 tvl x magdalena catharina sussana wilhelmina janse(n) van rensburg ca 1875 ,sy het n boetie nicolaas(johannes stephanus) goosen b 1890 en n sussie dorothea (cornelia) goosen b 1893 d 9-10-1928 jhb hul ma was na my mening maria gertruida opperman b ca 1857 d 28-8-1901 irene kamp . My Ouma was Petronella ( affectionately known as Nellie) Goosen. Nellie married Swanepoel and was widowed with three children; Shirley, Patsy and Louise who changed her name to Caroline. I am Caroline's daughter. Nellie then married a Joubert and had Jac and Leone. They lived at Lonely Mine, Bubi District. I was wondering what was Ouma Nellie's fathers name. I think his name was Samuel Goosen? And was he Christoffel Jacobas Goosen's son? My Ouma's mothers name was also Petronella Goosen. Does anybody know her maiden name and names of her parents. I think her maiden name was Oberholzer? I'm so glad finding Goosen families here. I'm trying to get info on my family, but up to now there was no luck. My grandfather was Nicolaas Adriaan Goosen. He lived in Somerset East ( Eastern Cape) South Africa. His father was Hendrik Jacobus Goosen als known as Tot. Is there anyone that can help me on information on where my family tree starts. Love to here from all. Ek is besig om my ma se kant van die stamboom te voltooi. Sy was 'n nooi Goosen. Ek kry egter geen inligting wat die stamboom verder vat as my Goosen oupa en ouma. Hy was Adriaan Johannes Goosen (17 Feb 1860 tot 23 Desember 1929) en getroud met Mathilda Louisa Van Niekerk (17 Nov 1886 tot 2 Maart 1943) Hulle het 8 kinders gehad; Miemie, Jan, Richard Davis, Attie, Mathilda (Tillie) (my ma), Tannetjie, Adrie en Piet. Hulle het in die omgewing van Ermelo en nader aan Swaziland geboer. Ek sal enige inligting opraap. In 1687 kom Jean Baptiste Goosen na die Kaap. Op 13\7\1698 is hy met Elisabeth Viant getroud.Hul het op Stellebosch gaan woon waar hy as skoenmakerskneg gewerk het.Uit die huwelik is drie seuns gebore nl.Adrianus(jonk oorlede), Cornelis en Elias.In 1699 het W.A.v.d.Stel sy vader as goewerneur opgevolg en veeboerdery aangemoedig.Hy het weilisensies uitgereik en Cornelis het hom toe anderkant die Roodezandkloof in Het Land van Waveren as veeboer gaan vestig.Cornelis is op 26\6\1729 met Wilhelmina Hendrina Berkman getroud.Hulle het 10 kinders gehad , maar die helfte is jonk oorlede.Twee seuns, Willem getroud met Sara Gous, en Johannes Cornelis getroud met Magdalena Malherbe, kon die familienaam laat voortleef.Voor die geboorte van hul eerste seun, Willem, het Cornelis twee buite- egtelike seuns by Apollonia van de Kaap gehad nl.Cornelis getroud met Eva Valentynse v.d.Kaap, en Johannes getroud met Sannatjie v.d.Kaap.Hul nageslag kom veral op die Kaapsevlakte voor. Die Ooskaapse Goosens stam van Cornelis en Wilhelmina se oudste seun, Willem, af. Johannes Cornelis se nageslag word in die Boland en Namakwaland aangetref.Willem Goosen en Sara Gous het 10 kinders gehad.Twee is jonk oorlede, maar die res het elk n groot nageslag nagelaat.Ses van hul kinders is met Bothas en twee met Nels op die oosgrens getroud.Teen 1780 het voorste trekboere hul langs die Visrivier gevestig.Die veeboere het dus trekboere geword.Die leenpagstelsel het elke veeboer toegelaat om n plaas van tussen 2000 en 3000 hektaar teen die betaling van 12 riksdaalders per jaar te gaan afpen.Uit die Land van Waveren is al langs die Breerivier getrek en toe tussen die see en die Langeberge ooswaarts tot by die huidige George waar digte woude en bosse hul pad versper het.Daar is toe oor die berge na die Kango in die Klein karoo tot by die Gamtoosrivier getrek.Die voorste trekke was al oor die Sondagsrivier.Teen 1775 het Willem Goosen en sy seun,Cornelis, hulle by Bruintjieshoogte, n streek tussen die huidige Pearston en Somerset- Oos, gevestig.Uiteindelik het die ooswaartse trek tot stilstand gekom toe dit deur die suidwaartse trek v.d. Xhosas gestuit word.In 1778 word die Groot-Visrivier as oosgrens v.d.Kolonie vasgestel.Hier word die veeboer- trekboer toe n grensboer. n Nuwe distrik, Graaff - Reinet, is in 1786 gestig. Dit was die woongebied van ons voorgeslag.Die pionier-grensboer was verplig om sy eie huis te bou, huisraad te maak, wa self te bou of in stand te hou, oorleer en sole self te looi om velskoene te maak.Sy vrou was die kleremaakster en sy het gekook, gebak, geslag, seep gekook en kerse gemaak.Rondtrekkende skoolmeesters het die kinders onderrig om te lees, te skryf en te reken. (Die volgende tekens gaan vir wat volg gebruik word: *gebore, =gedoop, +oorlede, #getroud).Stamvader: Willem Goosen =5\11\1730 #Sara Gous =21\8\1729. Tien kinders.Maria Josina = 27\7\1749. Jonk oorlede; Willem = 26\4\1752. Jonk oorlede; Pieter Johannes =1754 #6 \12\1785 Anna Botha =17/4/1768 (sewe kinders nl.) Willem Johannes =14\9\1786 #Elsie Johanna Lombard; Dorothea Cornelia =27\10\1788 #Hendrik Petrus Lombard; Sara Margaretha Elisabeth =26\11\1797 #Petrus Stephanus Erasmus; Pieter Nicolaas =26\12\1802 #Elsje Cornelia Botha; Anna Catharina Susanna =20\5\1805 #Petrus Hendrik Botha; Johanna Martha Josina =5\10\1806 #Johannes Andries Stydom; Hendrik Johannes Christoffel =26\12\1809 #Isabella Elisabeth Goosen. Nicolaas *26\6\1755 #28\2\1787 Anna Margaretha Nel. (Ses kinders nl.) Willem Adriaan =5\4\1789 #Gertruida Elisabeth Bothma; Anna Catharina =5\4\1789; Sara =6\1\1791; Pieter Hendrik =18\11\1792 #Sibella Elisabeth Goosen; Anna Catharina Margaretha =18\9\1796; Nicolaas Johannes Albertus =4\3\1804 #Anna Maria Bruwer. Ockert =1\4\1759 +20\5\1839 #4\1\1789 Sibella Elisabeth Botha ##7\6\1795 Anna Margaretha Botha =4\6\1780 +19\6\1948. ( Drie en tien kinders): CorneliaMargaretha =4\9\1791; Willem =1\4\\1793; Sibella Elisabeth =9\8\1795 #17\10\1813 Pieter Hendrik Goosen; Anna Susanna Margaretha #Johannes Hendrik v.d.Vyver; Sara Catharina =17\11\1797 #Marthinus Johannes Lombard; Dorothea Magdalena =7\4\1799; Ockert Johannes =22\6\1800 #Dorothea Magdalena Josina Botha =10\6\1805; Pieter Barendse =26\12\1802 #Anna Gesina Lombard; Willem Jacobus =15\4\1804; Christoffel Jacobus Francois =3\7\1809 #Isabella Jacomina Lombard; Johanna Maria *14\9\1811 #Johannes Hermanus Bosch; Nicolaas Gerrit Johannes *4\10\1814; Johannes Albertus *22\6\1820.Gerrit *5\5\1761 #25\10\1789 CatharinaMaria Botha =27\10\1774 (veertien kinders) nl. :Cornelia Margaretha Bosch; Willem Johannes *5\6\1794 #Maria Helena Charlotte Froneman; Theunis Christoffel =14\2\1795; Catharina Maria =29\7\1798 #Johannes Hermanus Bosch; NicolaasJohannes Albertus =4\3\1804; Christoffel Jacobus =4\3\1804 #Hester Antoinette Janse van Rensburg; Daniel Stephanus *29\3\1805 #Elsje Johanna Cornelia Lombard; Gerrit Pieter =1806 #Catharina Margaretha Prinsloo ##Anna Lombard ;Michiel =1807 #Elisabeth van Heerden; Sara Isabella Johanna =4\7\1808 +1861 #Hans Jurgen Nel *13\3\1794; Martha Susanna =20\12\1810 # Marthinus Johannes Botha; Agatha Gertruida *12\8\1812 #Philip Rudolph Botha; Anna Johanna *14\ 12\1814; Gerrit Jacobus *20\1\1826 #Maria Elisabeth Mentz; Sara Cornelia =30\3\1766 #14\10\1787 Pieter Barend Botha =15\4\1770; Anna Johanna =22\10\1769 #25\10\1789 Pieter Willem Nel; Martha Susanna =15\3\1772 #12\2\1792 Christoffel Jacobus Botha; Dorothea Magdalena *16\9\1774 #2\11\1800 Theunis Chritoffel Botha.Ons voorouers het maar taamlik in die bondel getrou, want jongmense het net by geleenthede soos nagmaal, huwelike en begrafnisse met hul eie en aangetroude familie kennis gemaak.Die Goosenfamilie van die Ooskaap het, net soos ander ou families, ‘n persentasie gekleurde bloed in hul are.Dit is veral afkomstig van Christoffel Snyman, seun v.d. vrygestelde slaaf Anthony van Bengale.Christoffel Snyman en Marguerite de Savoye se kinders het elk n groot nageslag nagelaat.Sy bloed is veral deur sy dogters, Maria Magdalena en Johanna, aan die Goosens oorgedra. Hulle was onderskeidelik met Theunis Botha en Anthonie Lombard getroud.Cornelis Goosen en Wilhelmina Berkman se nageslag het hulle in die volgende gebiede gevestig: Willem Goosen en Sara Gous se kinders en hul nageslag:- Graaff-Reinet, Somerset-Oos, Cradock, Queenstown, Bedford, Grahamstown en Uithenhage. (Oos-Kaapland).Johannes Goosen en Magdalena Malherbe se kinders en nageslag:- Stellenbosch, Paarl, Wellington, Tulbagh, Swartland, Namakwaland. (Boland en Namakwaland). I enjoyed reading about all the Goosens in all the different countries.I am busy updating the history of the family from the arrival of Jean-Baptiste untill the settlement on the eastern border of the colony along the Fish River. Hello! Our 'clan' of Goosen's are from South Africa (my Husband's family). I can give you the family names if you'd like? I would be interested to know if there are links to/how they fit into the rest of the Goosens world-wide. Hi, I would like to know more of the origin of the Goosens coming from Zeerust and later Krugersdorp? Hi, Michael Goosen , born 20-03-1970, (Zimbwe) has a son. Albert Thorsbrink Goosen. Does anyone have a family tree of the Goosen family in South Africa? Hi, Im looking for information about my grandparents: James Selkirk Goosen born 25/07/1931 and died 17/09/1974 and Marina Jubilee Goosen born 05/05/1935 and died 22/09/1979. I have no other information. Hi, me again. I introduced myself and my husband Alwyn at the beginning of last year. Alwyn is originally form Kleinzee (Northen Cape, South Africa). I also mentioned that a little Goosen was due in September last year. I had a miscarriage, but luckily was pregnant again soon after. Adriaan Louis Goosen was born on 21 December 2013, a beautiful little healthy boy. I am a descendant in the Heinrich Goosen family, so I'm curious as to whether I'm assuming correctly that Abraham Goosen may be a brother of Heinrich. I don't have any info re. Heinrich's earlier history other than his birth and location. I would appreciate help with this. Thank you. Hi To all the Goosens in the world!! Henrick Goossens married Katalijn Veerkens. Henrick is my father's father's, father's, father's, father's, father's, father's, father's, father's, father's, father's, father's, father's, father's, father's, father's, father's, father's, father's, father's father. (Henrick, Born 1293 - Died 136 (Katalijn, Born 1303 - Died 1377). Who is Henrick Goossens Children ? I am the Great Grand Daughter of the late Pieter Nicholas Goosen d.o.b. 10 April 1887,who relocated to Mazeppa Bay/Manyube, who was the son of Jacob & Louisa Goosen, who used to reside in Ugie. My granny was Kathleen (Baby) Goosen & my dad was Cyril Goosen. Hi to all the Goosens out there. I am the granddaughter of William Walter Henry Goosen, William Walter Henry Goosen married Emily Maria Accom, who resided in Ugie/Maclear. Would love to know if any Goosens out there knew my grandparents. Carl Goosen mentioned about Goosen's from Maclear. Carl's entry was made on 26May 2012. Carl would love to know whether you knew my grandparents or knew of them. I am looking for information to track my fathers genealogy he was born in 1942 Pieter Adriaan Goosen, his dad was Petrus Adriaan Goosen married to Femigje Goosen, his grand dad Samuel Antonie Martinus Goosen. All help will be appreciated.